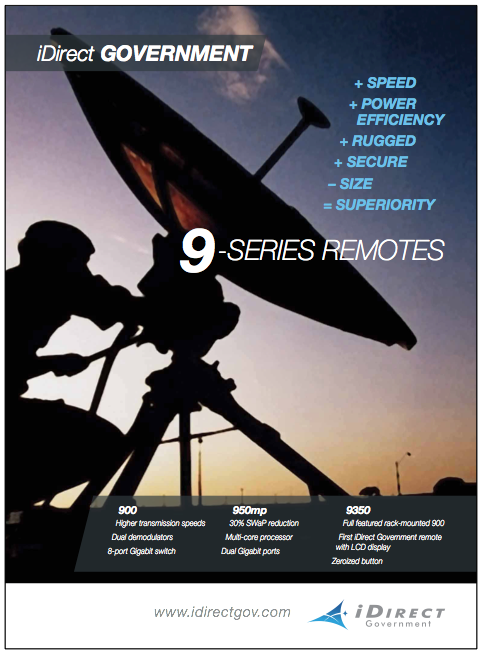 The potential advantages of that unprecedented capability are enormous. Instead of designing their satellites to accommodate the harsh reality that, once launched, their investments could never be repaired or upgraded, satellite owners could use robotic vehicles to physically inspect, assist, and modify their on-orbit assets. That could significantly lower construction and deployment costs while dramatically extending satellite utility, resilience, and reliability. In fact, efforts to achieve the goal of on orbit servicing are already underway, including DARPA’s Robotic Servicing of Geosynchronous Satellite (RSGS) program, which focuses on services for satellites in geosynchronous orbit. 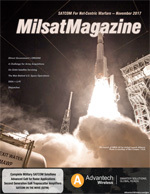 However, these efforts all face a major roadblock: the lack of clear, widely accepted technical and safety standards for responsible performance of on orbit activities involving commercial satellites. This includes rendezvous and proximity operations (RPO) that don’t involve physical contact with satellites and robotic servicing operations that would. Without these standards, the long-term sustainability of outer space operations is potentially at risk. DARPA’s Consortium for Execution of Rendezvous and Servicing Operations (CONFERS) program aims to help overcome these challenges and provide the foundation for a new commercial repertoire of robust space-based capabilities. CONFERS envisions a permanent, self-sustaining, and independent forum where industry could collaborate and engage with the U.S. Government about on-orbit servicing. This industry/government forum would be composed of experts from throughout the space community. DARPA, primarily in partnership with NASA, will bring decades of operational experience from government missions to the consortium. Participants would leverage best practices from government and industry to research, develop, and publish non-binding, consensus-derived technical and safety standards that servicing providers and clients for on orbit servicing operations would adopt. In doing so, the program would provide a clear technical basis for definitions and expectations of responsible behavior in outer space. The standards would be broad enough to allow individual companies to pursue their own implementations of these standards to suit their individual businesses, while assuring that the implementations adhere to best practices for operational safety. DARPA aims to transfer CONFERS leadership and funding to industry by 2021, when the Agency is scheduled to perform its first on-orbit demonstration of RSGS. The Agency also intends, by that time, to release the standards for general use by commercial on orbit servicing organizations. Mr. Todd Master joined DARPA in April 2016 from his previous position with Orbital ATK as a missions systems engineer. He was also the launch operations manager and deputy program director at International Launch Systems. He is now a program manager in DARPA's Tactical Technology Office. Hundreds of military, government and commercial satellites reside today in geosynchronous Earth orbit (GEO) some 22,000 miles (36,000 kilometers) abovethe Earth. That altitude is an ideal perch for providing communications, meteorology and national security services, but one so remote as to preclude inspection and diagnosis of malfunctioning components, much less upgrades or repairs. Even fully functional satellites sometimes find their working lives cut short simply because they carry obsolete payloads — a frustrating situation for owners of assets worth hundreds of millions of dollars. With no prospects for assistance once in orbit, satellites destined for GEO today are loaded with backup systems and as much fuel as can be accommodated, adding to their complexity, weight and cost. But what if help was just a service call away? 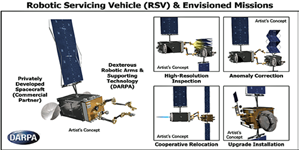 DARPA’s Robotic Servicing of Geosynchronous Satellites (RSGS) program intends to answer that question by developing technologies that would enable cooperative inspection and servicing in GEO and demonstrating those technologies on orbit within the next five years. In an important step toward a new era of advanced, cost-effective robotic capabilities in space, DARPA today announced that it has selected Space Systems Loral (SSL), based in Palo Alto, California as its commercial partner for the Agency’s Robotic Servicing of Geosynchronous Satellites (RSGS) program. 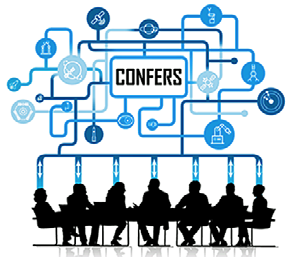 Through CONFERS, DARPA will establish an industry/government forum composed of experts from throughout the space community. The forum would develop non-binding, consensus-derived technical and safety standards for on orbit servicing operations, and help create definitions and expectations of responsible behavior in outer space.